Chill, moist air permeated the small apartment on the 10th floor of Lextor Towers. Four pairs of shoes patrolled the area, searching each inch of the place. Sprawled across a wooden desk in the largest room of the apartment, was the lifeless body of Dr. Edmund Cooper, a renowned name in the field of psychiatry and psycho-analytics, a surgical scalpel sticking out of his throat, the area caked with dried blood. Looming over him was the grim visage of Private Detective Tony Milestone, his keen blue eyes scanning the room for any clues he could find. The apartment was impeccably neat, everything was perfectly organised and nothing seemed out of place. His gaze fell back onto the pale face of the victim. He noticed a bit of brown paper sticking out from under the body. July 12, 2009 – Relationship Status: Single, living together (Elaine) – Previous history with drugs (minor, LSD). – Mood swings – Delusion…. Hastily, he closed the file and carefully wrapped it in a plastic bag, taking it back as part of the crime scene evidence. Promptly, he came down and started off to the station. A black mass moved on the opposite wall as the sirens faded into the night. The shadow of a well-built man, illuminated by the adjacent street lamp created an eerie image in the deserted, unholy neighbourhood. He wore brown leather boots and a matching hoody, seeming ready to run away if needed. He ambled along the road, his gaze fixed at whatever was in front of him, as though he was in a trance. The headlights of cars formed streaks and lines to his eyes, blinding and slowing him down. After an hour, the grim shadow arrived at the doorstep of Alexander Hemsway. He rapped four times on the wooden door and waited. A few moments later, he heard the lock opening from inside, the door slowly slid open to reveal a man in his mid-30s with graying hair. Hemsway looked up at his visitor and a smile erupted from his forlorn face. “So, you finally decided to pay lil ol’ Alex a visit, eh?”, he said in a squeaky tone, the result of an infection to his voice many years ago. He ushered the Visitor into the living room where a warm fire had been set up. They sat by the fireplace, having some vintage red Bordeaux, casually exchanging old college stories, as is the norm with old college mates. “So, how are things with you and your fiancé? Last I heard, your marriage had been fixed!”, said Alex. As the words sank in, something broke in the Visitor’s conscience. His nostrils flared up and his eyes widened to reveal bloodshot eyes. “Hell it was. You wanted me to be miserable? Why? WHY?”, he growled, springing to his feet. Towering over the terrified host, he gave a rubberneck look at him. Mad rage surrounded him. Shouts and thuds were exchanged, accompanied by occasional shattering of glass and tumbling of tables. Silence followed an hour later. The Visitor left the house, put on his hoody and swiftly faded into the night’s mist. The local police had surrounded the building as fine rays of sunlight diffused through the clouds. The neighbours had complained about the sounds from the night before. Detective Milestone made his way towards the crime scene; the police had reported a suspected murder. He entered the room which was in an utter chaos. And slouched up in a sofa was the limp body of Alex, a shard of glass from the Bordeaux thrust into his larynx. Scenes of Dr. Cooper’s murder flashed his mind. It looked unsettlingly similar to that case, which made him believe it couldn’t be suicide. After examining the body, as was his habit, his eyes began scanning the room for anything useful. Considering the state of the place, Milestone’s scanning looked hopeless. Just as he was about to give up, after 30 minutes of futile scanning, his eyes fell upon a fat, hardbound; the only object that was in its place; apparent perfection amid confusion. He opened the hardbound, a college yearbook, dated 2006. In it were a plethora of pictures, all sporting a faded sepia tone. One page was dog-eared somewhere in the middle. It had a picture of Alex and 2 others; a girl and boy simply named El and Don, respectively. Once again scenes from the previous case flashed before him. There was something scribbled in a scrawny hand on the bottom-right of the page. “102, No.30, Bumblebee Avenue”, it read. Seeing that there wasn’t any other clue on offer at the crime scene, he decided to check out the address. Late in the afternoon, the Visitor entered the local Walmart store, dropped his hoody and advanced towards the hardware section. In his haste, he didn’t notice a woman taking the corner of the aisle. She collided, her groceries promptly spilling out of her hands, onto the floor. He helped her up, helped pick her stuff and apologised. Then he looked at her. A fair, young lady in her late 20s, her brunette hair still made into a simple chic ponytail, her hazel eyes still radiant. Just as he had remembered her. “Ha..Hello!”, she said, eyes wide in disbelief. “How are you? It’s been quite a while, since…” No response came. 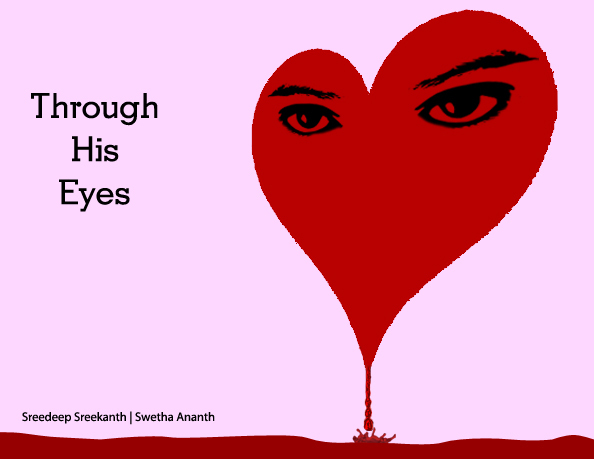 His eyes were fixed on her, his mouth quivered as he tried to reply. Unable to do so, he grunted, moved sideways and walked away, leaving her standing there, bewildered. Settling up her cheque, she started walking along Eastwood Road, a few blocks away from her place. The pale shadow of a man barely flickered in the orange lights as she turned the corner to Bumblebee Avenue. She entered a single storeyed apartment building and opened the door to 102. Minutes after she entered and placed the groceries in the refrigerator, she heard four equally spaced raps on the front door. She knew only one other person who did that. She opened the door and there stood the Visitor, her ex-fiance, Don. She looked up at him, let out a sigh and ushered him inside. They were in her bedroom, the hall was getting a new paintjob. “Why did you do all that? Why did you destroy my life?”, he said, controlling his growl as much as he could. “Do you know how hard the past few months were?” “Don, you know I didn’t do anything to hurt you. I cannot help it if you are too posses… I mean, if you misunderstood.”, she said, looking away at the rising moon. “Misunderstood? I don’t think seeing you hand-in-hand with that.. that guy is misunderstanding! 6 years it was El; 6 beautiful, beautiful years. You managed to kill it all off in minutes!”, he said, the pitch rising with each word he spoke. “I didn’t kill anything Don. You suspected me of a crime I didn’t commit. I have, and I still do love you. You just can’t see it through your green eyes!”, she sobbed, clutching the gold cross he had given her on their 2nd anniversary. Milestone had eliminated the other 5 ‘Bumblebee Avenue’s and was on his way to the last one on his list. A serial killer was at large; he had to find him, yet he had no real grasp on his identity. He reached the place mentioned in the address and found the door ajar. There was no sound. He went inside, crossed the half-painted hall, and navigated through the corridor. At the end was the door to the bedroom. And in it was a woman. The sharp end of a Gold Cross embedded in her throat, like an ancient medieval conquest. The words ‘So, Till the Grave!’ were inscribed on the cross. He recognised her as Elaine, from the photograph. He looked up and saw an open window and fluttering curtains. Her life had ended, but her blood was still warm. He was here a just a few moments back. I can still catch him! He called up the squad and asked them to set up a perimeter and scan the area. 83 anxious minutes passed by without any developments. He took his phone out and was about to call Thomas, Head of Squad 2 when he got a ring from Thomas himself. They had found a man in a hoody, unconscious in an alley. Milestone motored his way to the alley. He found a young man, in his early 30s, dirty and disheveled, in a foetal position. Donald Fisher, so it was you. But why? Tony had no time to see if that held any meaning. He ordered the squad to arrest Don. He was cuffed up, bound and taken for interrogation. The moon was full that night. But it’s light couldn’t penetrate the thick walls of the cell Don was kept in. He was on one side of a teak wood table and opposite him was the tired, yet confident face of Tony Milestone. He had got his man, and he was happy. Don had been connected to a polygraph, wires and probes attached to his chest, fingertips and now shaven head. “Now, Donald. You’ve got some explaining to do.” A visibly worn out Don seemingly had no idea what was happening. “I do? Why am I here? What do you want? Money?”. “Humour? Do I look like I’m amused Don? You have commited 3 murders. That amusing to you, punk?” “Mur…der? You’ve gotta be kidding me. Am I on Punk’d? Where’re the cameras! ?”, cried out Don as he studies his surroundings. Tony had had enough and began the polygraph test. He asked the control questions and set the norms for Don. “Did you commit 3 murders?” “No. I did not.” The polygraph didn’t show any deflection. Don was telling the truth. Apparently. “Do you know Alexander Hemsway?” “Yes”. No deflection. “You shoved a glass piece into his throat?” “NO!”. No deflection. Tony checked him this time to see if he was pricking his finger to cheat. He wasn’t. That cannot be. All facts lead to him! How can he not be it? His eyes widened. Taking a deep breath, he said, “Yes. She.. My fiance. Ex..fiance.” “Yes. Your ex-fiance, is now an ex-living person now.” “WHAT?” “Yes. She was murdered. By you. Why? All evidence is against you Donald. So cough up!” “I didn’ kill her. I DIDNT!”, he shouted. “So you didn’t kill anyone?” “No. I can’t do anything like that.” The polygraph hadn’t deflected the whole time. Tony had been saturated. He had no idea what to believe and what not to. He called the interrogation off for the night. Back at his place, he reopened Donald’s file, to check up what Dr. Cooper had written. Symptoms of amnesia are also shown. Unbelievable! So that explains the motive behind the murders! Insecurity! That drove him into committing the killings! He should be institutionalized, ASAP! Poor chap! Tony got up, picked up his stuff and immediately started for the station. Don had been lying in the same cell, a flickering bulb being the only source of light. He got up from his bed and clumsily leaned against the iron bars. Opposite to him, on a dirty yellow wall, there were two mirrors. One was a plain prison-standard one, with rusted steel bordering the murky glass; and right next to it, a shiny new mirror with fresh gold-painted borders, perhaps one left by the previous inmate. Intrigued, Don walked towards them and stood right in between the two, his reflection falling on both. He peered into the rusted one. A weary, forlorn face stared back at him. Rubbing his eyes he thought about what Tony had told him. He felt suddenly uneasy. He then walked towards the steel mirror. Taken aback, he stepped a few squares behind and looked again. Elaine’s unwavering gaze looked somberly at him. “Why have you come back? Why here?”, he screamed at the reflection. Frustrated, he punched the prison mirror with his fist. It shattered it into many small pieces. Yet she remained, in the gold one. “”Please go away, I’ve had enough! ENOUGH!” he cried, picking up a shard of broken glass. He started cutting himself, his palms and forearm, repeatedly looking into the mirror, smiling and continuing the routine, until he fell down. Anger got the best of him and in a final surge of rage, he plunged a shard into his abdomen. He quivered and his hands moved in a pool of blood. “Happy now?” he whispered. SIlence followed. The same words. What could it…. Wait. Tony bent down and had a closer look at it. Next Post DSLR and all. Man..!! The way u brought the close…. amazin wrk, both f u..!! Too good. I could visualize the entire plot. Seemed very real to me. Well, I couldn’t number the paragraphs as you intent them to be, but I think its in the 11th paragraph, 19th line, my mind gives me an error signal 🙂 and quoting now- “Yes.He was murdered. By you. Why? ” I feel its appropriate if its ” Yes. “She” was murdered. You might want to take a look. Thank you.